I recently installed my second ME888 Marathon Ultra on my 2013 Triumph Speedmaster. The ME880 Marathon tires were stock on my bike from Triumph, so I elected to move up to the 888 when it was time to replace my rear tire last year (the Stock 880’s lasted over 18k on the rear, 26k on the front). After 9,000 km of , my first ME888 (rear) was ready for a change. The mileage alone speaks for itself; if you live somewhere that the roads aren’t so flat, I imagine you could get over 10km out of a rear tire. Mind you, my Triumph is only 550 lbs., I imagine that plays a role. I’ve read several reviews where guys have complained about the handling in wet conditions; from my experience I think that has a lot to do with comfort, taste, and throttle discipline. I have experienced the rear tire breaking loose in the rain; more often than not because I got on the throttle too soon when exiting a curve. 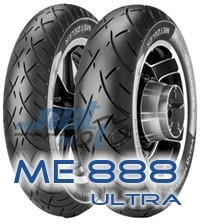 I’m currently on my first ME888 on the front (5.800 km… still ticking), and my second on the Rear, I would undoubtedly buy these tyres again.